What does one do when they visit the beautiful Pacific island of Okinawa? Hitting the beach is probably on the top of most visitors’ lists. For me, this would not be an option as my recent trip to the island was a short one. I love going to the beach but because I only had one day to hit as much as possible, I went snorkeling in one of the jewels of the island: Blue Cave, a sea grotto that promises stunning waters illuminated in bright blue. As you research before your trip, you’ll notice there are various ways to access this cave, including going to the location yourself with your own gear, walking down a steep staircase and then swimming over to the cave. But, the safest bet is through one of the many tour companies in the area, and since this was my first time here, I decided to let them do the planning for me. For 3,980 yen per person (around $36), the one I chose included a tour guide, wet suit, snorkeling gear and a boat ride to access this oceanic wonderland. It was a cloudy day when we set out on our speedboat to the cave. Jamming to some Japanese love ballads, the captain maneuvered around the small, but sometimes-choppy waves as we headed to the main attraction. On the way to the cave, the tour guide (a bilingual one) gave us instructions on how to use our snorkel. I’ve snorkeled before, but had never had instruction and I found his short tutorial extremely helpful. Earlier we had been outfitted with our wetsuits and water boots, so the ride to the boat on a bus and finally to the cave, was a little sweaty and uncomfortable. However, as soon as the tour guide gave me the thumbs up to fall in from the edge of the boat, I was immediately grateful for that extra skin, as the water is still a little cold in mid-March. Get ready to be surrounded by many fish if you decide to feed them. The second my mask hit the water, I could see the coral and multitudes of fish just below. A closer look, and I could see scuba divers scraping the seafloor even further down. It was like a scene out of The Little Mermaid. No matter how many times and wherever else I’ve snorkeled, I am always enchanted by the complexity and beauty we cannot see from the surface of the water. Our tour guide gathered us and while we held onto his pack, he led us into the sea cave. Once inside, the amount of people with other tours coupled with the sight of many scuba divers below became way more apparent and was somewhat overwhelming. The guide said it gets even busier in the summer months, so take note. When it was our turn to finally go into the actual Blue Cave, it did not disappoint. The water in this grotto glowed like a beautiful aquamarine gem, emanating florescent blue above and below us. The cave’s radiance made for some amazing, Instagram-worthy pics sure to make my friends back on the mainland jealous. Snorkelers gather at the entrance to Okinawa’s Blue Cave. Soon after, we exited the cave and then it was fish-feeding time. For an obscene 1,000 yen more ($9.80), I was given what looked and felt like were two balls of sandwich bread scraps. The fish didn’t care and enjoyed their expensive lunch. In return, I got to see a parrotfish with its metallic purple and blue scales up close. A bunch of his other striped fish friends joined us as well. This is where maneuvering in the snorkeling masks and fins gets a little tricky, a few times I hit my head on other snorkelers fins as we were so distracted by the fish surrounding us. You definitely need to be careful if you’re doing this with small children. Soon after the bread was gone, we were helped back onto the boat and maybe 20 minutes later we were back on land. The out-process of returning our gear and the outdoor showers at the facility was very efficient. My only complaint is there weren’t any showers in the locker rooms, so I couldn’t use soap or shampoo to clean off the ocean salt. Just a quick rinse and dry, then off we were to change from our wet bathing suits back into our street clothes. 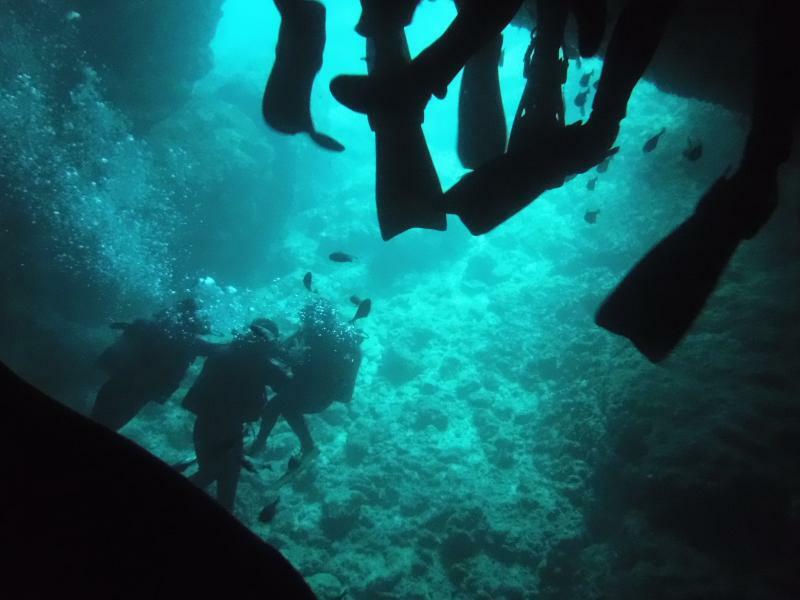 Blue Cave can get crowded with people trying to get a good look, so ​​plan ahead. Since I was low on time, I wasn’t able to take advantage of other packages these tour companies offer that pair snorkeling in the Blue Cave with kayaking, sea walking, banana boat rides, parasailing, and the scuba diving I mentioned before. Fortunately, we were really tired after our snorkeling tour and I don’t think I would’ve been a happy kayaker had I needed to get back to the pier on my own. All in all, it was a great way to not only soak for a while in Okinawa’s beautiful waters and to get acquainted with their ocean life, but it was a nice time to spend with friends. *There are a couple of options to get to the point. Visitors can either go to the bottom of Cape Maeda, and swim from there to the cave or take a boat from a port nearby. *Lockers, showers, and parking space is available at Cape Maeda. *For more info, check out the cape’s website (http://www.maedamisaki.jp/en/).